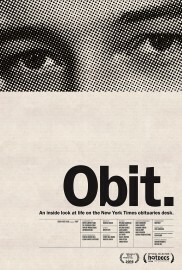 With a harrowing journey into the lowermost rings of the New York Times’s obituaries department, Obit uncovers the unique day-to-day of the brave writers who are tasked with summing up, respectfully and accurately, the lives of the recently deceased. Death, the great haunter, hovers at the foot of this film, but is examined in a way that is surprisingly inspirational, uplifting and often hilarious. Director Vanessa Gould has crafted the perfect documentary with morbid wit and fearless curiosity. What is it like to be a journalist who not only questions grieving interviewees, but must offer condolences to them when the discussion is over? How does it feel to share a cubicle with a coworker who proudly displays a bumper sticker that says, “Please Die”? Gould answers these questions and unearths a fascinating, brilliant collection of biographers who are tragically misunderstood. Through the use of archival footage and photographs, Obit highlights some of the more impactful, stand-out lives that have made the death pages, but Gould’s biggest victory is in capturing what the obituary writer must overcome in order to condense those lives into an 800-word story. The documentary morphs into a chilling suspense thriller as obituary writer Bruce Weber battles with a blank page under a tight deadline, with an ill-fated four o’clock meeting looming overhead. This type of conflict is unique to the writer, and rarely caught on film in such gory detail. Gould cuts the tension masterfully with intermittent glances of the New York Times “morgue,” an underground haystack for historians and journalists seeking the needle of serendipity – an overwhelming, messy block fort of rusty metal file cabinets and faded manila. At least it seems that way to the uninitiated. Jeff Roth, who has managed the morgue’s millions of undigitised photographs and clippings for decades, sees it differently: “When you come in here, it looks pretty chaotic, but, no.” The film is worth watching for Roth’s comic timing, alone. Obit takes a profession that is “a little off-putting in a party situation”, studies its anatomy and reveals a very animated, very talented team of professionals, artfully dispelling the myth that the obituaries department is where writers go to die. Obit does not have a UK release date yet. For further information about Tribeca Film Festival 2016 visit here.